Check which listening squawks and frequencies cover your planned route. Check NOTAMs: For up to date information on specific NOTAM, including Restricted Areas (Temporary), Airspace Upgrades and Emergency Restrictions of Flying, you can call the AIS Information Line on 08085 354802 or +44 (0)1489 887515. Check the local and en-route weather and check again just before flight. There are a number of free online pre-flight planning tools available to assist pilots in safely and easily planning their Visual Flight Rules (VFR) flights in and around busy airspace and to check NOTAMS. NATS (National Air Traffic Services) has awarded its Safety Compliance Mark to SkyDemon Light. The mark indicates that the product complies with functionality set out by NATS to enhance flight safety. Always have a Plan B. If you are planning a controlled airspace (CAS) crossing, ensure that you have a back-up to avoid the airspace in case a clearance without delay is not possible. 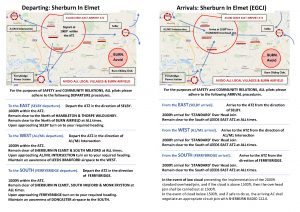 To increase your chances of transiting controlled airspace plan your route and prepare your R/T transmissions. aircraft at the critical stages of flight when departing, arriving and flying in the vicinity of an aerodrome. Birmingham Airport Air Traffic has created a dedicated website to help pilots identify the visual reference points (VRPs) around its airspace and help reduce airspace infringements. The website includes information on various VRPs and guidance on how to fly safely near controlled airspace. Two Stansted TMZs were established in 2009 due to the large number and severity of controlled airspace infringements. To enter a TMZ you MUST have an operational Mode S transponder, with altitude information. Suitably equipped aircraft may access a London Stansted TMZ without ATC approval although pilots are strongly recommended to establish communication with Farnborough LARS or Essex radar. Alternatively make use of the Listening Squawk (A7013).